The Firexpress systems offer a number of unique advantages that no other system can match. Most importantly, the Firexpress systems eliminate all the drawbacks of high pressure systems. Fast temperature knock down - Because of the instantaneous evaporation of the micro-drops, the temperature of the fire will drop immediately, even when the initial temperature of the fire is low. Reduced air intake - Because the evaporation process generates high pressure steam, oxygen in the surrounding air is prevented from getting to the fire. Cooling surrounding area - Because the steam will cool the flammable gasses surrounding the fire and other combustible materials in the vicinity, the improved control of the fire scene will reduce the risk of a possible expansion of the fire. Maximum utilization of water - Because the micro-drops are exceptionally small, virtually all the water sprayed into a fire is used to reduce the heat of the fire. Minimum use of water - Because of the highly efficient use of water, considerably less water is needed with the Firexpress systems than with other systems for extinguishing a fire. Minimum water damage - Because virtually all the water vaporizes, there is minimal damage caused by excess use of water. 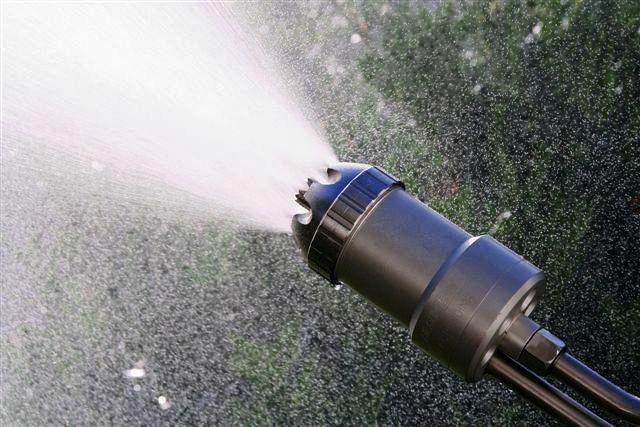 Low pressure - Because of the design of the dual nozzle is the nozzle pressure very low. Minimum entrained air - Because of the low momentum of the micro-drops, virtually no entrained air is drawn into the spray, which prevents oxygen from air dragged along by the water drops from fuelling the fire. Low recoil - Because of the low nozzle pressure virtually no recoil is experienced by the user, making it easy for the fire fighter to handle the lance, even for an inexperienced and untrained person. Safe to use on human skin - Because of the low nozzle pressure, it is safe to spray directly on humans to put out fires in clothing. Long range - Because of the design of the nozzle, the Firexpress systems can spray micro-drops up to 15 metres and a jet of mixed water and fire fighting foam up to 18 metres. Electric fires - Because of the unconnected micro-drops, the Firexpress systems can be used on electrical fires of up to 10,000 volts as tested by the National Yunlin University of Science and Technology of Taiwan. Breaking windows - Because of the sturdiness of the lance, it can be used to break windows and penetrate some construction materials. Personal protection - Because of the design of the angled lance, the fire fighter is able to avoid direct exposure to fires. No spreading of burning debris - Because of the low momentum of micro-drops, burning debris will not be spread, avoiding an expansion of the fire. Protection of fire scenes - Because of the low momentum of the micro-drops and limited water damage, the fire scene which potentially can be a crime scene is protected from disturbance. The advantages of the Firexpress systems originate from the Firexpress fire fighting concept and the Firexpress lance. The micro-drops are unique to the Firexpress systems.